Marshmallow is not just for kids anymore. In the past few years, there’s been a surge of gourmet marshmallows. I frequently see lavender, lemon, and chocolate flavored marshmallows for sale in clear plastic bags with a bow at price that usually exceeds $5. Even the good old Jet Puffed marshmallows from the grocery store have expanded into different sizes and flavors. This may be why I love marshmallows more now than I did as a child. The light fluffy texture is irresistible and when combined with chocolate, it’s easily one of the best confectionary combinations. Homemade marshmallows take these sweet airy puffs to another level. Not only can you control the texture, you also have some control over the sugar content. This recipe is based on a classic version by David Lebovitz. A process similar to Italian meringue, the use of egg whites makes a super fluffy, almost spongy marshmallow that can easily be eaten on its own. If you’ve never made marshmallows, this is the recipe to try. So why mug toppers? Well if you haven’t figured it out from the photos, mug toppers are simply marshmallows cut into rounds about the size of the top of a mug. This allows the marshmallow to fully cover the top of your hot cocoa so there are fewer holes or cracks. More surface area of marshmallow means more delicious mouthfuls of melting sweet marshmallow foam and hot chocolate. As if that’s not enough, I also stuffed these marshmallows with a layer of mini chocolate chips. As the marshmallow melts into your mug, bits of melted chocolate add a delightful contrast to each sweet foamy sip. A perfect treat for the family on a cold winter Sunday or cut in the shape of hearts for that special someone on Valentines Day. These chocolate chip stuffed marshmallow mug toppers are sure to satisfy the sweetest of sweet tooths. In a small bowl, sprinkle the gelatin over a 1/2 cup of cold water to dissolve and soften. In a small saucepan fitted with a candy thermometer, mix the sugar and corn syrup with 1/2 cup of water. Place over medium high heat. In the bowl of an electric mixer, pour in the egg whites and pinch salt. Beat on low speed until frothy. When the syrup reaches about 210 degrees, increase the speed of the mixer to high and beat the whites until they are thick and fluffy. When the syrup reaches 245 degrees, while the mixer is running on high speed, slowly pour the hot syrup into the whites in a steady stream, avoiding the whisk. Scrape the gelatin and water into the pan that you used for the syrup. Add 2 tablespoons of the water into the pan and swirl it to dissolve. (Place over low heat if necessary but there should still be residual heat left in the pan from making the syrup in it to dissolve it). Pour the liquified gelatin slowly into the whites as they are whipping. Add the vanilla extract and continue to whip for 5 minutes, until the mixture feels completely cool when you touch the outside of the bowl (if mixture is not cooled all of the way, it will cause the marshmallows to perspire). Sift together corn starch and powdered sugar in a large bowl. Dust a 9” x 13” baking dish evenly and completely with a layer of this mixture. Make sure there are absolutely no bare spots. Use a spatula to spread half the marshmallow mixture in one even layer in the dish. Sprinkle chocolate chips in one layer on top. Pour remaining marshmallow mix on chocolate chip layer and carefully spread so that the layer is even. Allow to dry for at least 4 hours, preferably overnight, uncovered. Dust the top of the marshmallows and a large cutting board with some of the remaining cornstarch sugar mixture. Loosen sides of the marshmallow sheet and turn out onto cutting board. 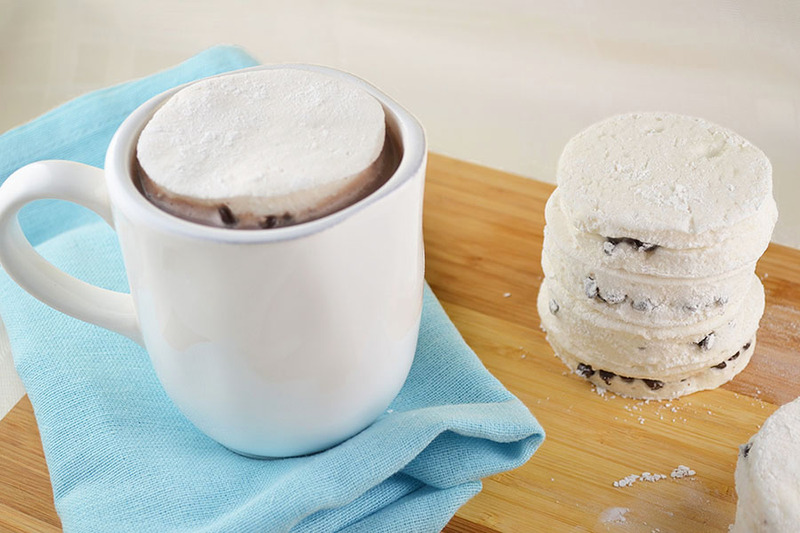 Dip a two inch round (or whichever size fits the top of your mugs) cookie cutter and cut rounds of the marshmallow. Toss rounds in the cornstarch sugar mixture. Shake the rounds vigorously in a wire strainer to remove the excess powder. Place on hot steaming mugs of hot chocolate or cocoa and enjoy! Storage: The marshmallows can be made up to one week in advance, and stored in an airtight container.